Western mainstream media (MSM) typically present Iran as a degenerate and impoverished society under the sway of Islamic terrorist fundamentalists. Alternate media and seriously investigated works present a much different picture. Dan Kovalik’s The Plot to Attack Iran highlights the current state of affairs in Iran in the context of decades of covert and direct attacks aided and/or instigated by the U.S. and its allies. The history starts with a contemporary scene in 2006, with the U.S. intentions to attack Iran, using nuclear weapons. Kovalik argues that with Israel being bogged down in Lebanon by Hezbollah at that time, it stalled the planned assault. As with Iraq, Iran was considered by the MSM as a terrorist state supporting al-Qaeda, wanting to develop nuclear weapons, and repressing its people under a totalitarian regime. The story then fast forwards to the past few years. Combined with the “oil war” in which prices are controlled mainly by Saudi Arabia oil production increases or cuts, “current U.S. economic sanctions” are “an act of economic terrorism in that it constitutes the intentional infliction of injury against the civilian population to bring about a desired political end – but it is par for the course for the United States.” The civil disturbances as depicted by the MSM and the U.S. government was not about “civil liberties” but were mainly about the economy. Collateral to this oil war, originally aimed at both Russia and Iran, is the effect on the Venezuelan economy. These links and associations to other areas of U.S. imperial designs are a strong point of Kovalik’s overall presentation, demonstrating the global attempts to subjugate and overturn any government that goes against U.S. wishes. Another factor with U.S.relations with Iran is “the United States has also been involved in supporting terrorist groups against Iran. The most notable such groups as the Mujahadeen e-Khalq (“MEK”…).” This organization “was de-listed as a terrorist organization by the Obama Administration in 2012.” John Bolton, then and now, leads the charge against Iran, previously aided by Secretary of State Hillary Clinton. The latter is very noticeable throughout Iraq, was on the path to succeeding in Syria, and has been practiced daily over the years in occupied Palestine. 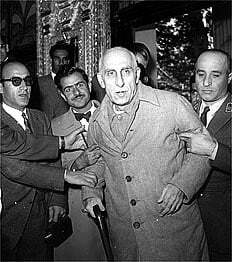 Then, at least according to MSM accounts, the Iranian people suddenly overthrew the Shah and installed their dictatorship under Ayatollah Khomeini, holding dozens of U.S. embassy personnel hostage until subsequently released after some shady dealings with Ronald Reagan’s electoral campaign. Kovalik weaves the story through the Iran-Iraq war and its many side issues: the Iran-Contra affair; the use of WMDs by Iraq (poison gas from U.S. sources); Israeli and U.S. support given to both sides hoping to exhaust them both. Another side trip is taken through Guatemala and the attempts to overthrow the Sandinista government. Guatemala was the U.S.’ CIA second overthrow, as following the Mossadegh coup in Iran, the same tactics were applied to overthrowing the democratically elected government of Jacobo Arbenz (image on the right), not for oil this time, but to stop land reform and for the United Fruit Company of Boston (now Chiquita). Unfortunately, this kind of history goes back to the founding fathers (who adopted British colonial racist policies) as George Washington is cited, “lay waste to all settlements around…that the [native] country not be merely overrun but destroyed….Our future security will be…in the terror which the severity of the chastisement they receive will inspire in them.” Welcome to the empire – Iraq, Libya, Guatemala and many dozens of other countries attacked by the U.S.
Kovalik’s conclusions are obvious. Iran is not a threat to Israel (who have some 200 nuclear warheads to Iran’s zero warheads). Iran is not a threat to the United States (well, perhaps in combination with Russia and China and the avoidance of the US$ as the empire continues to decline). Oil is not required especially in an era when the U.S. could be leading the world with ‘green’ technology (okay, see the US$ again). 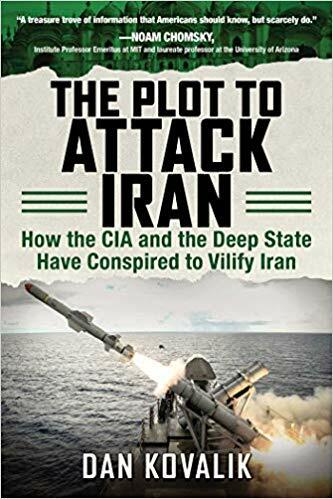 Kovalik’s book, The Plot to Attack Iran – How the CIA and the Deep State Have Conspired to Vilify Iran, is mainly about Iran, it necessitates all the associations he brings to it concerning other U.S. efforts at subjugating a foreign nation to their imperial demands. It is a well written work using many sources and personal anecdotal material, putting Iran’s story into a global and historical context, once again implicating the U.S. in humanitarian and war crimes, a good read for knowledge about the Middle East, Iran in particular, and about the workings of the U.S. empire.